Leiseus.net » Abandoned doujin software? 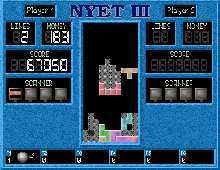 If you’ve got time you should try out Nyet III, which is one of the best Tetris-variants ever made. It’s a game with all sort of short Tetris challenges, combines with item-use! Anyway, where I wanted to go to is the following: from a post at the forum of insert credit I’ve found a site called AbandonGames, only for doujin games. Even though you should of course get them through legal means if possible (like buying them through sites like Palet Mail or Himeya), DoujinStyle is truly useful for games that are really hard to get, especiallly outside Japan. Check out the doujin shmups if you can, there are some really great ones between them! « So you thought juggling was lame? 04.12 People hate failing, unless you watch it from a distance! 04.10 Will it blend, that’s the question! 04.06 The first game I’ve finished in ages! 03.30 A wiki with how-tos is a pretty good idea! 03.24 Kings and Pirates in pixel art? 03.23 250MB, PHP, MysQL, Perl, POP3 e-mail, now for $00.00! 03.22 Headphones can be fakes? 03.17 DIY floating books, CDs, DVDs and more! Leiseus.net © 2008 Douggie. Hemmed theme by Charlie.